Indicate the number of shares outstanding of each of the registrant’s classes of common stock, as of the latest practicable date. 2,150,000 as of July 22, 2009. The purpose of this Amendment No. 1 to the Annual Report on Form 10-K, previously filed with the United States Securities and Exchange Commission on July 27, 2009, is to correct Item 9A(T) and the audit opinion of the results of operations and cash flows for the cumulative period, March 27, 2007 (date of inception) to April 30, 2009. This Amendment also includes corrections to the language in the certifications, specifically, Exhibits 31.1 and 32.1 as required under section 302 of the Sarbanes-Oxley Act per Release No. 33-8238 and Item 601(b)(31) of Regulation S-K.
We were incorporated as “Vortec Electronics, Inc.” in the State of Nevada on March 26, 2007. Our principal offices are located at No. 16D, Jalan 6/5 Taman Komersial Pandan Indah, Malaysia. 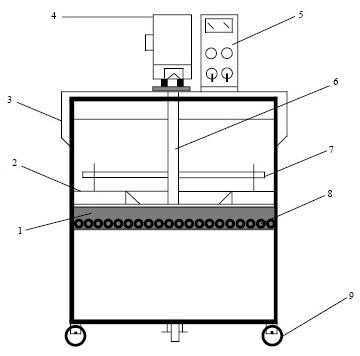 We are engaged in the business of designing, developing, manufacturing, and selling a fully automated frying wok, which will be used as an automatic fried rice cooker (the “Product”) specifically for commercial applications. We are currently testing and refining the prototype Product, which we have built in our facility in Shanghai, China. When we are satisfied that our Product provides the highest-quality of fried rice possible for the consumer, we will begin the manufacture and distribution of the Product to restaurants, dining halls, and grocery stores throughout mainland China. Fried rice (炒飯) is a popular component of Chinese cuisine. It originated as a homemade dish from China, made from cold leftover rice fried with other leftover ingredients. It is sometimes served as the penultimate dish in Chinese banquets (just before dessert). There are dozens of varieties of fried rice, each with their own specific list of ingredients. In Asia, the more famous varieties include Yangchow (Yangzhou) and Fukien (Fujian) fried rice. In the West, Chinese restaurants catering to non-Chinese clientele have invented their own varieties of fried rice including egg fried rice, Singaporean (spicy) fried rice and the ubiquitous 'special fried rice'. China is an industrialized nation with factories that supply products not only domestically, but internationally as well. Most factories are staffed by workers who have left the farm, figuratively and literally, within the last generation. They work and often live at the factory, traveling long distances to and from their homes if they don’t sleep at the factory. As a result, Chinese factories have large dining halls created to feed the hundreds or thousands of employees. Because fried rice is such a staple of the Chinese diet, these dining halls cooks hundreds of pounds of fried rice daily. Restaurants and grocery stores similarly make enormous amounts of fried rice each day to feed those who work in the city in a factory or office that does not have a dining hall. Fried rice made in these bulk quantities is generally cooked in an extra-large (larger than one meter in diameter), iron wok, heated by charcoal or heating oil. Because these materials don’t burn 100%, some of the byproducts of combustion float into the air and then drop on the food. Also, it is difficult to control the temperature of the wok, and cooks generally use their hands to stir the food, so the food is often not cooked evenly and issues of hygiene abound. Ingredients used in fried rice are greatly varied. They include vegetables such as carrots, bean sprouts, celery, peas, and others, as well as chicken, pork (usually Char siu), shrimp, or tofu. Generally cooked in a wok, fried rice includes vegetable oil or animal fat to prevent sticking, as well as for flavor. Bits of egg provide color in many dishes. Chile pepper or hot sauces often add a piquant touch to this dish or are offered in a small dish on the side of the rice. Many cooks season the fried rice with black pepper. Soy sauce gives fried rice its brown color and savory taste. Often, onions and garlic add complexity and extra flavor. It is popularly eaten either as an accompaniment to another dish or, alternatively on its own as a course by itself. Popular garnishes include fried shallots, sprigs of parsley, carrots carved into intricate shapes or sliced chili sprinkled on top of the heaped rice. Many foodstands found on the streets across Southeast Asia will cook and serve fried rice on the spot. The wok is a versatile round-bottomed cooking vessel originating in China. It is used especially in East and Southeast Asia, including Indonesia, Malaysia, and the Philippines. The word "wok" comes from the Cantonese Chinese word for the item, 鑊. Most Chinese families own at least one wok. It is most often used for stir frying, but can also be used many other ways, such as in steaming, deep frying, braising, stewing, or making soup. The wok's most distinguishing feature is its shape. Classic woks have a rounded bottom, making them resemble a section of a sphere. Hand-hammered woks are sometimes flipped inside out after being shaped, giving the wok a gentle flare to the edge that makes it easier to push food up onto the sides of the wok. Woks sold in western countries are sometimes found with flat bottoms - this makes them more similar to a deep frying pan. The flat bottom allows the wok to be used on an electric stove, where a rounded wok would not be able to fully contact the stove's heating element. Most woks range from 30 cm to 2 meters or more in diameter. Woks of 36 cm (14 inches) (suitable for a family of 3 or 4) are the most common, but home woks can be found as small as 20 cm (8") and as large as 91 cm (36"). Smaller woks are typically used for quick cooking techniques at high heat such as stir frying. Large woks over a meter wide are mainly used by restaurants or community kitchens for cooking rice or soup, or for boiling water. Woks by design are meant to be used over a pit-style stove, where the heat arising from the fuel is fully directed at the bottom of the wok, with no heat escaping around the edges. These pit stoves originally used wood or coal, but are now more typically a gas stove that has burners that are recessed below the stove's surface, to encompass the wok's shape. Curved grates on the stove provide stability to the curved wok. This allows foods to be stir-fried at a very high heat, sometimes hot enough to deform the woks themselves. Pit stoves are typically used by professional chefs in most Chinese restaurants, since they have the heating power to give food an alluring wok hei (unique wok flavor). Woks, be they round or flat bottomed, do not generally work well for stir-frying or other quick cooking methods when used on an electric cooker. These stoves do not produce the large amounts of quick even heat required for stir-frying. However, it is possible to find round-shaped electric stove elements that will fit the curve of a wok, which allows the wok to be heated at its bottom along with part of its sides. A flat-bottomed wok may also work better on an electric stove. The main advantage of a wok is traditionally considered its curved concave shape. The shape produces a small, hot area at the bottom which allows some of the food to be seared by intense heat while using relatively little fuel. The large sloped sides also make it easier for chefs to employ the tossing cooking technique on solid and thick liquid food with less spillage and a greater margin of safety. Curved sides also allow a person to cook without having to "chase the food around the pan" since bite-sized or finely chopped stir-fry ingredients usually tumble back to the center of the wok when agitated. The curve also provides a larger usable cooking surface versus western-styled pots and pans, which typically have vertical edges. This allows large pieces of food seared at the bottom of the wok to be pushed up the gently sloped sides to continue cooking at a slower rate. While this occurs another ingredient for the same dish needing high heat is being cooked at the bottom. These advantages of having a rounded bottom do not apply, however, to cooking fried rice as all the ingredients are cooked in the bottom of the pan. Because fried rice is such a staple of the Chinese diet, significant amounts of manpower are used in the preparation of this dish for millions of factory workers, as well as other urban dwellers, each day. Our Product will significantly reduce the amount of labor required to feed those in China and other countries that utilize fried rice to a substantial degree. The most immediate application is in the feeding of China’s factory employees. For most, going home or eating out for lunch is impractical. Thus, most factories have cafeteria-style dining halls where they feed hundreds or thousands of employees, cooking hundreds of pounds of fried rice each day. Restaurants and grocery stores similarly make enormous amounts of fried rice each day to feed those who work in the city in a factory or office that does not have a dining hall. Fried rice made in these bulk quantities is generally cooked in an extra-large (larger than one meter in diameter), iron wok, heated by charcoal or heating oil. Because these materials don’t burn 100%, some of the byproducts of combustion float into the air and then drop on the food. Also, it is difficult to control the temperature of the wok, and cooks generally use their hands to stir the food, so the food is often not cooked evenly and issues of hygiene abound. Our Product, the Automatic Wok or Automated Fried Rice Cooker, addresses all of these concerns associated with cooking large quantities of fried rice in traditional woks. Our Product (see Figure 1) consists of a large (2 meter diameter) stainless steel pot (2) on a thermal transfer surface (1) sitting atop electric heating unit coils (8). A control panel (5) allows the user to control the temperature of the surface, adjust the speed of the stirrer, and time the entire process. The motor (4) atop the unit rotates the drive shaft (6) and ultimately the stirrer (7), which is uniquely shaped to ensure that the rice is cooked evenly and completely, even with the large batch sizes for which our Product was designed. The framework of the Product supports the top of the unit (3), along with the control panel and motor. This leaves all 360 degree access to the unit and the rice, which is being cooked inside. The entire unit is set atop four wheels (9), which allows cooks to pull the Product out for use and move it easily to a corner for storage when not in use. To use our Product, a cook would heat the steel pot to cooking temperature and add approximately 500 ml of peanut oil – enough to coat the bottom of the pot. He would add up to 100 lbs of cooked rice and a commensurate amount of other ingredients (green onions, carrots, eggs, shrimp, beef, chicken, peas, bean sprouts, celery, tofu, etc. ), depending upon the cook’s recipe. Then he need only wait until the unit’s timer sounds, notifying him that the dish is ready and that the heat has been automatically reduced from a frying temperature to a maintenance temperature. Servers can then portion out servings for up to 250 diners before repeating the process. Concerns of hygiene are addressed as the unit’s stirrer mixes the dish, rather than the cook’s hand. The design of the stirrer ensures that ingredients are mixed properly and all come into contact with the heated, oil-covered surface equally. The powerful electric coils keep the surface of the pot at a high, constant temperature, eliminating the problem of hot and cold spots on the surface and in the rice. Finally, because the pot is heated by electric coils, there are no byproducts of combustion floating above and into the final product, which could affect the taste and safety of the final fried rice dish. We face significant competition in the market for cooking apparatuses designed for the preparation of fried rice in China. Traditional woks have been used for thousands of years in China and surrounding countries. Such traditional devices, utilizing traditional methods, are widespread and universally accepted both culturally and practically. While we feel that our Product offers significant advantages, there is significant inertia in Chinese culture regarding a break from traditional methods of food preparation. We compete with a number of established manufacturers, importers and distributors who sell traditional woks to restaurants, factory dining halls, grocery stores, and individual consumers. These companies enjoy brand recognition which exceeds that of our brand name. We compete with several manufacturers, importers and distributors who have significantly greater financial, distribution, advertising and marketing resources than we do. We compete primarily on the basis of innovation, practicality, quality, brand name recognition, and price. We believe that our success will depend upon our ability to remain competitive in our product area. The failure to compete successfully in the future could result in a material deterioration of customer loyalty and our image and could have a material adverse effect on our business. While we have performed no intellectual property protection to date, we intend to aggressively assert our rights under trade secret, unfair competition, trademark and copyright laws, if applicable in the countries we conduct business, to protect our intellectual property, including product designs, proprietary manufacturing processes and technologies, product research and concepts and recognized trademarks. These rights are protected through the acquisition of patents and trademark registrations, the maintenance of trade secrets, the development of trade dress, and, where appropriate, litigation against those who are, in our opinion, infringing these rights. We are subject to the laws and regulations of those jurisdictions in which we plan to sell our product, which are generally applicable to business operations, such as business licensing requirements, income taxes and payroll taxes. In general, the development, manufacture, and sale of our product in China is not subject to special regulatory and/or supervisory requirements. We have no other employees other than our officers and directors. If finances permit, however, we intend on employing sales representatives in Shanghai when our product is ready for production and shipping. We have incurred $0 in research or development expenditures since our incorporation. We maintain our corporate office at 50 West Liberty Street, Suite 88, Reno, NV 89501, the address of our transfer agent. We have no materially important physical properties. No matters were submitted to a vote of the Company's shareholders during the quarter ended April 30, 2009. As of April 30, 2009, we had 2,150,000 shares of our common stock issued and outstanding, held by 40 shareholders of record. The Company has not declared, or paid, any cash dividends since inception and does not anticipate declaring or paying a cash dividend for the foreseeable future. We have been and intend to continue to refine our prototype over the coming months at our facility in Shanghai. While we feel our Product in its current form could compete effectively in the marketplace, we plan to improve the design to increase its efficiency and effectiveness, and, therefore, its attractiveness to cooks, dining hall managers, restaurant managers, and others, including consumers of fried rice. We expect to incur roughly $10,000 on our Research and Development in the next twelve months. We do not currently have any manufacturing facilities. Our directors have contacted several general manufacturers in and around Shanghai, China, and have begun negotiations for the manufacture of our Product on a contract basis. We are currently negotiating price, payment, customer guarantee, shipping, inventory, delivery schedule and returns. Production of our Product doesn’t require any facilities or equipment beyond what is available at any general manufacturing facility. We plan to contract with one or more general manufacturing facilities to manufacture our product by following our instructions. We do not anticipate renting a warehouse at this stage of our business. The manufacturer we select to work with us will provide packaging, storage, and shipping services for us as part of our agreement. Our goal is for our Automatic Wok to become a leading product in the Chinese marketplace. In order to achieve our goal, we intend to increase awareness of our product with potential customers. Attending national and regional electronics sales and promotional events and conferences. We plan to attend a number of events attended by electronics merchants in order to further expose our product. These events will include electronics merchandise trade meetings and promotional events that are attended by electronics related wholesalers and retailers and related seminars and conferences. Developing direct marketing programs to attract retailers. In addition to attending the foregoing conferences and seminars, we intend to market directly to factories with dining halls, large restaurants, and grocery stores. Our marketing will include conducting seminars and the use of online and traditional advertising media such as newspapers and trade publications. Promoting to the public through Internet-based and traditional media advertising. We intend to use Internet-based and traditional media to promote our product directly to the public to raise public awareness of our product. Our intent is to have end consumers pull our product through the distribution line by demanding that the kitchens providing their fried rice adopt our efficient, economical technology. We intend to spend approximately $2,000 on counsel and filings fees in the next twelve months on intellectual property protection regarding the design of our Product. In the short term, we intend to use the services of our management to sell our products. As our product approaches the manufacturing stage, however, we plan to employ up to thirty salesmen in Shanghai, China to promote and sell our product to wholesalers, retailers, dining hall managers, restaurant managers, and grocery store managers. These sales representatives will be responsible for soliciting, selecting and securing accounts within a particular regional territory. We expect to pay such sales representatives on a commission basis. In addition, we may decide to pay each sales representative a base salary. We expect to provide service and support to our sales representatives, including advertising and sales materials. Other operating expenses, which consist primarily of the expenses incurred for further development of our Product; for the advertising campaign for our Product; and for and other administrative expenses. We estimate that our other operating expenses for the next twelve months will be approximately $24,000. We anticipate that, in time, the primary source of revenues for our business model will be the sale of our Product. We generated no revenue for the period from inception (March 27, 2007) to April 30, 2009. We are a development stage company and do not yet have any products to sell. Our operating expenses for the year ended April 30, 2009 consisted entirely of professional fees in the amount of $9,500, while our operating expenses for the year ended April 30, 2008 also consisted of professional fees but in the amount of $51,518. Our operating expenses for the period from inception (March 27, 2008) through April 30, 2009 consisted entirely of professional fees in the amount of $65,523. We had a net loss of $9,500 for the year ended April 30, 2009, compared with a net loss of $51,518 for the year ended April 30, 2008, and a net loss of $65,523 for the period from inception (March 27, 2007) to April 30, 2009. As of April 30, 2009, we had total current assets of $0. Our total current liabilities as of April 30, 2009 were $22,523. Thus, we have a working capital deficit of $22,523 as of April 30, 2009. Operating activities used $43,000 in cash for the period from inception (March 27, 2007) to April 30, 2009. Our net loss of $65,523 was the primary negative component of our operating cash flow. Cash flows provided by financing activities during the period from inception (March 27, 2007) to April 30, 2009 consisted of $43,000 as proceeds from the issuance of common stock. As of April 30, 2009, there were no off balance sheet arrangements. As required by Rules 13a-15 and 15d-15 under the Exchange Act, our chief executive officer and chief financial officer carried out an evaluation of the effectiveness of the design and operation of our disclosure controls and procedures as of April 30, 2009. Based on their evaluation, they concluded that our disclosure controls and procedures were effective. Under the supervision and with the participation of our management, including our chief executive officer, we conducted an evaluation of the effectiveness of our internal control over financial reporting based on the criteria established in Internal Control – Integrated Framework issued by the Committee of Sponsoring Organizations of the Treadway Commission (“COSO”). Based on this evaluation under the criteria established in Internal Control – Integrated Framework, our management concluded that our internal control over financial reporting was effective as of April 30, 2009. The following information sets forth the names of our current directors and executive officers, their ages as of April 30, 2009 and their present positions. Room 403 12-340 Mudan Rd., Pudong, Shanghai, China. CMC Compound, Mercedez Ave, Brgy San Miguel, Pasig City 1600. Set forth below is a brief description of the background and business experience of executive officers and directors. Melissa Lopez. Melissa Lopez has been our President, Chief Executive Officer, Chief Financial Officer, Treasurer, and Director since our inception. Since May 2003, Miss Lopez has been a Business Development Manager of Pacific Consultants International Asia, Inc. Miss Lopez has an MBA from Jose Rizal University, and BS from Pamantasan ng Lungsod Ng Maynila. Kai Ming Hung. Kai Ming Hung has been our CTO and Director since our inception. Since 1996, Mr. Hung has been engineer of Sen Fat Electronics Ltd. Mr. Hung was educated at Nanyang Technological University. Imelda Tin. Imelda Tin has been our CTO and Director since our inception. Since 2001, Miss Tin has been a corporate associate engineer of Thomson Corp. Miss Tin has an MS from De La Salle University and a BS from Philippine School of Business Administration (PSBA-Manila). Our company currently does not have nominating, compensation or audit committees or committees performing similar functions nor does our company have a written nominating, compensation or audit committee charter. Our directors believe that it is not necessary to have such committees, at this time, because the functions of such committees can be adequately performed by the board of directors. A shareholder who wishes to communicate with our board of directors may do so by directing a written request addressed to our President and director, Ms. Melissa Lopez, at the address appearing on the first page of this annual report. April 30, 2009, we had not adopted a Code of Ethics for Financial Executives, which would include our principal executive officer, principal financial officer, principal accounting officer or controller, or persons performing similar functions. The table below summarizes all compensation awarded to, earned by, or paid to both to our officers and to our directors for all services rendered in all capacities to us for our fiscal years ended April 30, 2009, 2008 and 2007. The table below summarizes all unexercised options, stock that has not vested, and equity incentive plan awards for each named executive officer as of April 30, 2009. The table below summarizes all compensation of our directors as of April 30, 2009. We did not have a stock option plan in place as of April 30, 2009. The following table sets forth certain information known to us with respect to the beneficial ownership of our Common Stock as of April 30, 2009, by (1) all persons who are beneficial owners of 5% or more of our voting securities, (2) each director, (3) each executive officer, and (4) all directors and executive officers as a group. The information regarding beneficial ownership of our common stock has been presented in accordance with the rules of the Securities and Exchange Commission. Under these rules, a person may be deemed to beneficially own any shares of capital stock as to which such person, directly or indirectly, has or shares voting power or investment power, and to beneficially own any shares of our capital stock as to which such person has the right to acquire voting or investment power within 60 days through the exercise of any stock option or other right. The percentage of beneficial ownership as to any person as of a particular date is calculated by dividing (a) (i) the number of shares beneficially owned by such person plus (ii) the number of shares as to which such person has the right to acquire voting or investment power within 60 days by (b) the total number of shares outstanding as of such date, plus any shares that such person has the right to acquire from us within 60 days. Including those shares in the tables does not, however, constitute an admission that the named stockholder is a direct or indirect beneficial owner of those shares. Unless otherwise indicated, each person or entity named in the table has sole voting power and investment power (or shares that power with that person’s spouse) with respect to all shares of capital stock listed as owned by that person or entity. Except as otherwise indicated, all Shares are owned directly and the percentage shown is based on 2,150,000 Shares of Common Stock issued and outstanding as of April 30, 2009. Addresses for all of the individuals listed in the table below are c/o Vortec Electronics, Inc., 50 West Liberty Street, Suite 880, Reno, NV 89501. Incorporated by reference to the Registration Statement on Form SB-2 filed with the Securities and Exchange Commission on June 22, 2007. We have audited the accompanying balance sheets of Vortec Electronics, Inc. as of April 30, 2009 and 2008, and the related statements of operations, stockholders’ equity (deficit), and cash flows for the years then ended and for March 27, 2007 (date of inception) through April 30, 2009. These financial statements are the responsibility of the Company’s management. Our responsibility is to express an opinion on these financial statements based on our audit. We conducted our audits in accordance with the standards of the Public Company Accounting Oversight Board (United States). Those standards require that we plan and perform the audits to obtain reasonable assurance about whether the financial statements are free of material misstatement. The Company has determined that it is not required to have, nor were we engaged to perform, an audit of its internal control over financial reporting. Our audit included consideration of internal control over financial reporting as a basis for designing audit procedures that are appropriate in the circumstances, but not for the purpose of expressing an opinion on the effectiveness of the Company’s internal control over financial reporting. Accordingly, we express no such opinion. An audit includes examining on a test basis, evidence supporting the amounts and disclosures in the financial statements. An audit also includes assessing the accounting principles used and significant estimates made by management, as well as evaluating the overall financial statement presentation. We believe that our audits provide a reasonable basis for our opinion. In our opinion, the financial statements referred to above present fairly, in all material respects, the financial position of Vortec Electronics, Inc. as of April 30, 2009 and 2008, and the results of its operations and cash flows for the periods then ended and for the period from March 27, 2007 (date of inception) through April 30, 2009, in conformity with U.S. generally accepted accounting principles. The accompanying financial statements have been prepared assuming that the Company will continue as a going concern. As discussed in Note 5 to the financial statements, the Company has limited working capital, has received limited revenue from sales of its products, and has incurred losses from operations. These factors raise substantial doubt about the Company’s ability to continue as a going concern. Management’s plans with regard to these matters are described in Note 5. The accompanying financial statements do not include any adjustments that might result from the outcome of this uncertainty. Vortec Electronics, Inc. (“Vortec”) is a development stage company and was incorporated in Nevada on March 27, 2007. The Company is developing an automatic fried rice cooker. Vortec operates out of office space owned by a director and stockholder of the Company. The facilities are provided at no charge. There can be no assurances that the facilities will continue to be provided at no charge in the future. The accompanying financial statements have been prepared in accordance with the Statement of Financial Accounting Standards No. 7 ”Accounting and Reporting by Development-Stage Enterprises”. A development-stage enterprise is one in which planned principal operations have not commenced or if its operations have commenced, there has been no significant revenues there from. Vortec considers all highly liquid investments with maturities of three months or less to be cash equivalents. At April 30, 2009 and 2008 the Company had $-0- of cash. Vortec’s financial instruments consist of cash and cash equivalents. The carrying amount of these financial instruments approximates fair value due either to length of maturity or interest rates that approximate prevailing market rates unless otherwise disclosed in these financial statements. Vortec does not expect the adoption of recently issued accounting pronouncements to have a significant impact on the Company’s results of operations, financial position or cash flow. Accrued expenses at April 30, 2008 consisted of amounts owed to the Company’s outside independent auditors and attorneys for services rendered for periods ended January 31, 2008. The amount due to officer of $22,523 at April 30, 2009 consisted of amounts owed to an officer of the Company for amounts advanced to pay for professional services provided by the Company’s outside independent auditors for services rendered for periods ending on and prior to April 30, 2009. The amount is unsecured, due upon demand, and non-interest bearing. For the periods ended April 30, 2009, Vortec has incurred net losses and, therefore, has no tax liability. The net deferred tax asset generated by the loss carry-forward has been fully reserved. The cumulative net operating loss carry-forward is approximately $65,500 at April 30, 2009, and will begin to expire in the year 2027. Vortec has incurred losses since inception, has negative working capital, and has not yet received revenues from sales of products or services. These factors create substantial doubt about the Company’s ability to continue as a going concern. The financial statements do not include any adjustment that might be necessary if the Company is unable to continue as a going concern. The ability of Vortec to continue as a going concern is dependent on the Company generating cash from the sale of its common stock and/or obtaining debt financing and attaining future profitable operations. Management’s plans include selling its equity securities and obtaining debt financing to fund its capital requirement and ongoing operations; however, there can be no assurance the Company will be successful in these efforts.